CHENGDU, China, Jul 20, 2016 (SEND2PRESS NEWSWIRE) -- EaseUS has devoted months of research and development to enhance iOS data recovery effects in new 6.0 update. Tuned EaseUS MobiSaver recovers photos, videos, messages, WhatsApp chat history, contacts, call logs, notes and more lost data from iOS devices with high efficiency across Mac and Windows platforms. EaseUS iPhone data recovery solution works seamlessly with the latest iOS 9.3 edition and iPhone 6s or iPhone 6s Plus. EaseUS keeps focus on data security and goes steps further no matter for mobile devices or PCs in the new released 6.0 MobiSaver. EaseUS iPhone data recovery program makes quick recovery from data loss disaster and never risks losing data again. Many unexpected incidents can cause severe data loss especially for mobile devices which are widely used in daily life and modern people usually store all kinds of information on. EaseUS restoring iOS device data from iTunes or iCloud backups takes less time and cost for the reason that EaseUS MobiSaver access any lost files that are synced to iCloud and iTunes even when iOS devices are missing or stolen. 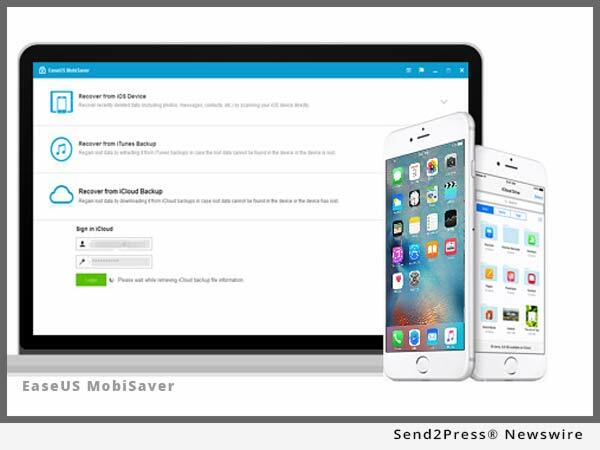 EaseUS MobiSaver starts scanning to find all lost files exactly when iPhone, iPad and iPod Touch are connected to Windows PC or Mac. Fully compatible with features of iOS 9.3 and previous system, EaseUS iPhone data recovery software ensures to extract lost data in a safe manner and takes full use of advanced mobile functionality. Preview before recovery is available of EaseUS MobiSaver to catch a clear glimpse of recovery results in prior and soothe anxious nerve fast. Meanwhile, careful data filter makes sense to accurately restore everything that counts before moving on to the next step recovery. Otherwise, when necessary or any emergency occurs, EaseUS MobiSaver allows to stop scanning process and export what have retrieved in specific file format for the next recovery that can continue to restore without scanning again. Also such robust features of EaseUS 6.0 iPhone data recovery software are now supported in new German, French, Spanish, Italian, Portuguese, Chinese and Traditional Chinese editions. EaseUS provides professional IT solutions for home, education and SMB users, service providers in data recovery, backup, system optimization and partition manager on both Windows and Mac platforms. Founded in 2004, EaseUS has established itself as a fast-growing international company with over 100,000,000 wonderful users in the world. For more information, please visit http://www.easeus.com. iOS(r), iPhone(r) are registered trademarks of Apple Inc..